DIY cards with Tombow!!!! That is what is going at the Tombow booth at CHA in LA! Laura Kelly put together this little make and take and in includes my favourite recycled pencils from Tombow! You NEED THIS! 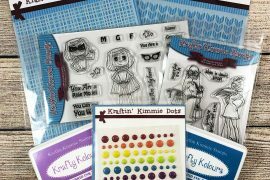 Guess what you can win them along with 1o Note Cards and Envelopes, 50 Die-Cuts and Tombow Adhesive Dots. YAHOOOO! CLICK HERE to visit Laura’s blog for all the details and to enter to win!